I’ve had countless conversations with technology enthusiasts and professionals who wish to step into the world of a home lab. Typically, we’ll chat about design, use case, and cost, with a few questions that are often repeated. I’ve been a staunch supporter of home labs, ever since building one years ago to start down the path of becoming a VMware Certified Professional, and have reaped the benefits many times over. Having a lab is a superb way to get your hands dirty with hardware and troubleshooting that just can’t be experience in a “cloud” environment. This is no knock on remote labs, such as the VMware Hands on Labs, which are great for having a place to sandbox a software stack or application. I like a neat and efficiently designed lab. As such, there are a few “enterprise” rules that I break for the home lab layout. The first centers around switch placement. Unless you’re trying to deploy a true data center cabinet of gear, which calls for a switch placed top-of-rack (TOR), I like to sandwich my networking gear in the middle of storage (bottom) and compute (top). Cost is reduced partially because you’ll use shorter cables and in lab modifications. Here’s why: rather than buying a lot of custom length cables to reach the lower and middle levels of your lab, you’re buying roughly the same length of cable. Basically, you’ve standardized on a cable length that is easy to consume regardless of where you put the gear, making layout modifications much less annoying. If you add new gear, you can stockpile a few extra cables without worry, instead of having to acquire various lengths to cover each tray or shelf height. I’ve also found that there are more choices for short cable lengths between 1 to 7 feet than beyond that. I also mentioned less cabling mess. This can help save dollars in the form of eliminating airflow problems that can occur in non racked setups (like mine) where the long cables would form a barrier somewhere. It also feeds into my next section on organization. I use Monoprice exclusively for all of my cabling. 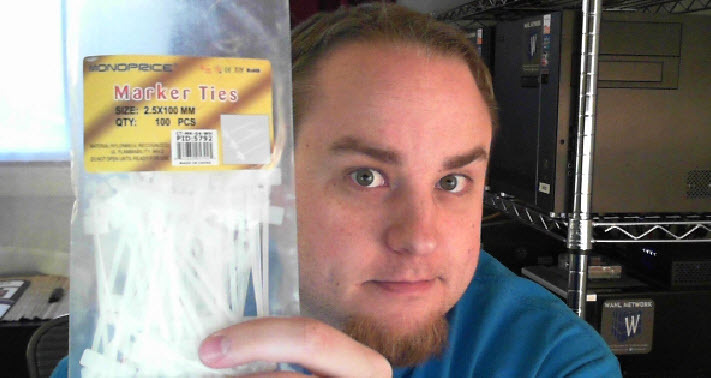 They are awesome and have a ton of Cat6 selection. Another equipment layout trick is to mount power strips inverted at each level of your home lab shelving. This greatly reduces the cabling complexity and allows you to make your power grid modular. In my case, I have one for the computing top tier of my lab, another for the networking middle tier, and a third for the bottom storage tier. I’ve highlighted the one for my computing tier, which sits right below three of my lab servers. So you just bought that new, shiny Widget 9000 device and set up an IP address, cabled it up, and are ready to go to town. Fast forward a few weeks or months. Where did you plug in that thing and what port is it using? I would normally have no idea, and unless your lab is super tiny, you probably won’t either. Normally you’d use these little guys to tie together a number of cables and mark them, but I use them on the ends of each cable to denote where it’s going. The switch end tells me what server or storage array is connected, and the opposite end tells me which switch and port is connected. 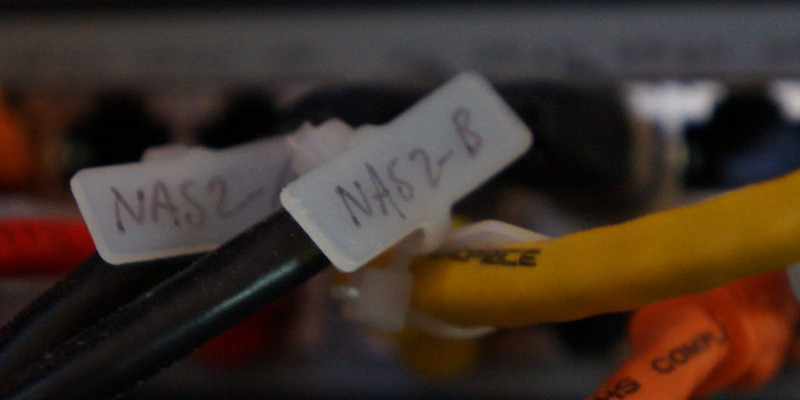 Here’s a closeup of the marker ties on my switch cabling. The final tip is to buy quality storage, especially if you plan to build a lab for virtualization. You can get away with desktop CPUs for your servers or a cheapy consumer grade network switch, but don’t cheap out and think you’re going to get away with a 2-bay NAS enclosure to run 25 virtual machines. It won’t work. I’m a huge fan of Synology arrays and have heard good things about whitebox Nexenta builds. Design for performance first, then make up for capacity needs. Flash is everywhere these days. Be it server-side caching via vSphere as the vSphere Flash Read Cache or a third party such as PernixData FVP, the use of an SSD for your write log in ZFS, or simply cramming a ton of SSDs into an array like in my Synology 2411+, you’ll need flash. It’s much cheaper in the long run than trying to pack an array with spindles, consumes less power, produces less heat, and provides the much needed IOPS bling. Make sure you can survive a disk failure. Don’t use RAID-0 for any data you care about, because failure happens. For my flash array, I use RAID-5 or RAID-SHR to help spread out wear (the latest generation of Synology DSM 4.3 supports TRIM with certain SSDs in specific RAID configurations). I doubt your lab will really need double parity from RAID-6 or the heavy handed approach with RAID 1+0 unless you have a significant number of disks. And finally, have a backup. Something in your lab will be “production” – like the Domain Controller perhaps – and should be protected from site failure. Veeam is a great option that has NFR licenses for a slew of IT professionals or even the free edition. Then, once you have your backup plan in place, restore from it. Make sure the restore works on some sort of regular basis. Otherwise, you’re just wasting your time. 1 quick question about the power strips. All my equipment is on a baker’s rack. I have 4 UPSes that power my lab and they are all on the bottom rack. Are you suggesting moving the UPS to be closer to where the machines are or are you talking about connecting powerstrips to the UPS and placing the strips by the machine? Due to weight (lower center of gravity provides increased stability), I personally would leave the UPSs on the bottom and locate the power strips near the machines. I think it depends on if your UPS supports power strips, or if you care about that support. It’s typically not an issue unless you want the remote outlet control or auto shutdown features. I just use power strips with a long enough cable to reach each tier of the lab. Great tips Chris. One tip that I never follow and I always regret – Documentation. I can’t tell you how many times I’ve built a new lab just because I didn’t remember to document my earlier configuration months ago. This includes most importantly passwords. I’m currently looking at redoing my home lab. My AMD 8 core is nice and CPU is barely touched, but I maxed my 32GB of RAM and need another host. Thing is, I’d rather go with a micro or mini-ITX build to conserve on space and power. My 18U wall-mount rack only has so much space. I run about 8 VM’s on a Synology DS1812+ (with 3GB of RAM). I haven’t noticed anything as far as speed since I installed it a few months ago. I get anywhere from 70-95MB/s transferring from my workstation to my file server. Running a HP V1910-24G as my switch. Looking at the DS1813+ since it comes with 4 Gig ports and true Link Aggregation. I’m using a Enterprise Plus NFR at home so I’d love to play around with vDS and more. I’m still researching a powerful low-power Intel whitebox that can at least do 32GB of RAM. @ Chris Conlan. I would have a look at the Shuttle SH67H3, takes 32GB ram and I use the Intel i7 3770 cpu in mine, great little work horses and capable of running a single quad port NIC in there as well. Just about to take delivery of my 3rd one this week. Thanks for the suggestion. I was originally looking at Shuttle to see if they had a barebone yet for the Haswell CPU’s. Might just go with that build you suggested. I already have 32GB of GSkill from the old host to put in there. Just have to build an additional one so I can finally do vMotion. Well, I’m going with Haswell. No clue why, but seems like Provantage is the only one with the new Shuttle Haswell barebone. So I ordered that and the i7-4770s. Going to toss in my 32GB of memory from my other host and the Intel 4 port NIC and see how it goes. I am going to be putting in some spare SSD drives shortly to test out vSphere Flash Cache. Also, building an identical box this week. I’m trying out a different NIC that is about $100 cheaper (Intel Quad Port still). Storage resides on Synology DS1812+. I find it funny people I work with think I’m crazy for recommending Synology boxes for small business that want shared storage. EMC is not a good option for that. That looks like a slick build. How do you like the Intel NIC? I haven’t had any issues as of yet. I did on the 2 port I had sometimes disconnecting, but after doing research I just needed to patch the host (when I was running 5.1). I just got the Shuttle barebones today and the other Intel NIC so I’ll be putting that together shortly. I’d love to get the new DS1813+ since that has 4 NICs and does true 802.3ad. But then I’d have to find a buyer for my 1812+. Did you have any issues with the SH87R6? On the shuttle website they don’t list the 4770s as a compatible CPU but they do list the 4770 and 4770k. Haven’t had any issues so far. I am having one host just spoke being able to be pinged after awhile, but I haven’t had a chance to troubleshoot it. That’s great thanks. Have you ever tried to pass the onboard video through to one of the VMs? If you have a chance could you give that a try? If I could get video output from one of the VMs I’d be able to use it as a HTPC which would be perfect.